Unless you are getting delivery of an antique car that no longer runs, hiring a vehicle towing company is normally accompanied with a lot of stress and aggravation. More often than not, it is related to a roadside emergency, such as a collision or car breakdown that cannot be repaired on the spot. In such situations, it is good if you can go with a towing company that you can trust to do a quick and professional vehicle towing job – for a reasonable cost. It is not easy to offer cheap towing services, while still maintaining high quality, professionalism, and safety – but that is exactly what we do at Green San Diego Towing. When evaluating vehicle towing prices, there are numerous factors that must be taken into consideration. The three main pricing factors are the type of towing service (ranging from regular towing to flatbed towing), the distance the towing operator needs to travel in order to tow your vehicle, and whether the service call is during the day or during the night. Other factors that might affect the price of towing your vehicle include extra charges for heavier vehicles such as pickup trucks, or if the vehicle must be rescued from a ditch. Green San Diego Towing offers professional 24 hour vehicle towing service across San Diego for very reasonable rates. No matter what type of vehicle you have, and what kind of tow you need – car, truck, motorcycle, short distance or long distance – we can safely and economically tow your vehicle even on very short notice. 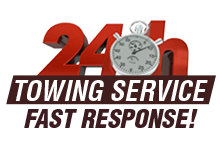 Just call our friendly 24×7 customer service line at (858) 457-8530 and we will send over one of our professional and experienced tow truck operators within 30 minutes. At Green San Diego Towing, all of our tow truck operators are highly qualified and experienced in providing all types of tow service for all makes and models of vehicles. They are all fully licensed, insured and bonded and use the most advanced tow vehicles and equipment. That is how we earned our reputation for providing high-quality, professional, towing services that ensure the safety of your vehicle at very competitive prices.